We are happy to announce that our ICO starts less than in 4 hours. Our ICO will be held from 15 November until 19 December. We have a limited bonus of 15% for early contributors. We aim to ‘bridge the gap’ between those with access to finance and those without, eliminating borders, intermediaries and prejudices. Etherecash offers Lawyer Backed Smart Contracts which ensure the borrower and lender are legally secure. We facilitate loans against cryptos, giving you access to funds without needing to liquidate your cryptos. This helps you to maximise the potential of your assets. The Etherecash Crypto Debit Card is revolutionizing the way we spend, by giving you multiple options to spend your cryptos online, in-stores and for ATM withdrawals in local currency. Dear friends! We have great news for you. If you were looking for a chance to meet us, here it is. 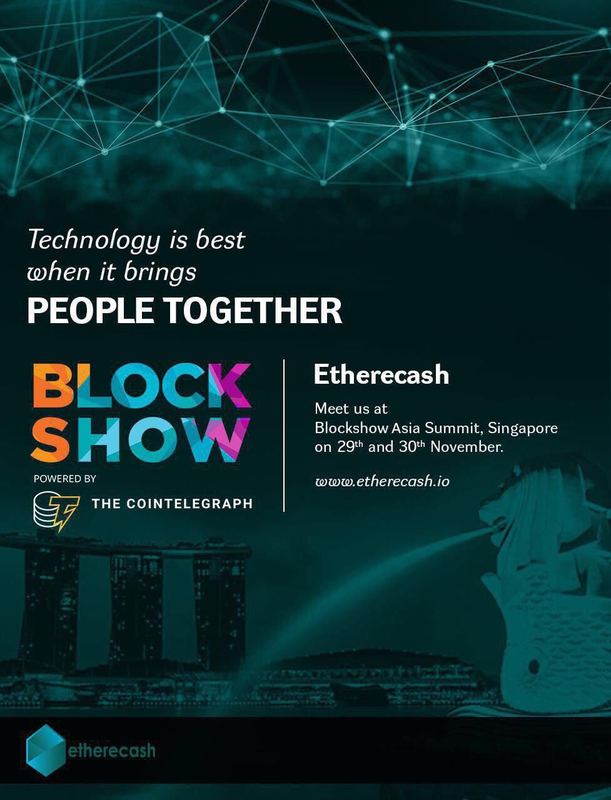 We are going to the Blockchain Asia Summit, Singapore on 29th and 30th. See you there!